Our wet wipes are perfect for cleaning dust, dirt, and fingerprints without leaving streaks, spots, or smudges. 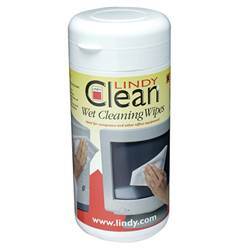 These wipes are universal and can be used to clean any plastic surface, including monitors or televisions, laptops, mobile phones, cameras, and / or tablets. Compatible with all major manufacturers and brands. Dimensions: 14 cm x 17 cm.